Okay, according to our last post, the plan was to leave in early February and head to the Bahamas. The planned December dual 30 amp inverter installation didn't happen, for some very good reasons that I won't go into. Unfortunately, the new 50 amp inverters didn't arrive as early as hoped so our early February departure was pushed back. We didn't really mind the delays so much because our son, John, and his wife, Meredith, were staying with us while looking for new jobs. Of course, since they were expecting to have the house to themselves, we did begin to feel that we were imposing! While we were home, we enjoyed Christmas with two of Joe's sisters, Pam and Tina, Pam's husband Patrick and their daughter, Lara. < Then, on New Year's Day, we had "Christmas" with John and Meredith and our daughter Caitlin and her s/o, Andy. Somehow the "family at the table" photo didn't happen, but you can tell by Rocky's posture that we all had a good time. After all the festivities, we got busy with "house" stuff. Once the squirrels had eaten through the boat house wiring three times, Joe took action. We figure he relocated all the squirrels in our neighborhood by the time he was through. We both tackled the two rooms in the house that hadn't been remodeled - popcorn ceiling removal being the priority. Finally, the day arrived. We had packed the car up the night before and left early Monday morning. Joe had missed a call on his phone and returned it after we got on the road. It was Neil from Silver Queen who was at Green Cove Springs. He let us know that Carolyn Ann was not ready to go in the water yet. So, after confirmation, we turned around and asked to spend two more nights with John and Meredith. Wednesday, February 25th, we took off again and this time made it to Green Cove Springs and found Carolyn Ann ready and waiting for us. Well, sort of. She was in the water, but we had contracted for several repairs/upgrades that hadn't yet been completed. And there were issues with the new inverters. And issues with the upgraded navigational charts.... The good news here is that when we arrived at Green Cove, we were greeted by many other Mirage boat owners. We had a great time catching up with those we already knew, and getting to know some new owners. And, of course, Costco isn't too far away! Joe cooked a great dinner to share with Mike and Linda Borum (Sea Dream) and Neil and Sheila Ingram (Silver Queen). It was a sad day when four of the boats took off together and left us. First, Silver Queen left... then Lazy Dolphin left... ...then Moon Beam and Chutay left. But the next day, one returned - Silver Queen had computer problems. They left the next day, returned again the next, left again the next. As much as we like them, we hope they don't come back again! The dock here is interesting. It is high and concrete - used to be a Navy hurricane hole. It is now home to an odd assortment of ships in addition to the pleasure boats. The security is good with a coded gate at the entry. You can drive your car onto the dock and park right next to your boat. The down-side is that the dock is so high the climb up and down to the boat can be adventurous sometimes. (Just ask our friend, John Sarachene. But don't poke him in the ribs!) One of the ships that is here is R/V Arctic Discoverer. It was a research vessel that discovered the Central America steam vessel loaded with gold that sunk during a hurricane in 1857 off North Carolina in 8000' of water. The ship had over 200 million $(today value) in gold on-board and was depicted in the best seller "Ship of Gold". Mike Borum happened to already have another book written about the discovery which is a pictorial representation of the recovery. Such a sad ending for a grand explorer. Due to the delays, we've decided to postpone our trip to the Bahamas until next winter. We really want to do the "Loop" this year and will need to start north for that soon. For now, we're sitting here in Green Cove Springs spending our days doing stuff to the boat and watching the Mirage guys do stuff to the boat. Between trying to figure out the new inverters and trying to install new software (off defective disks!! ), Joe's pretty much pulled out any remaining hair he had. 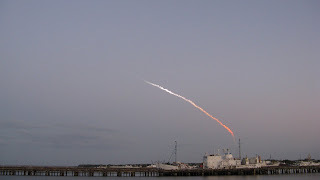 Today while waxing the boat and Joe fighting the software we saw the shuttle launch! The bright specs to the upper left are the shuttle and the twin solid fuel boosters falling away. Spectacular! God Speed.